I recently came across this huge CAPODIMONTE porcelain figure piece. This is a huge Capodimonte figure and it is 16 inches at it’s widest point. 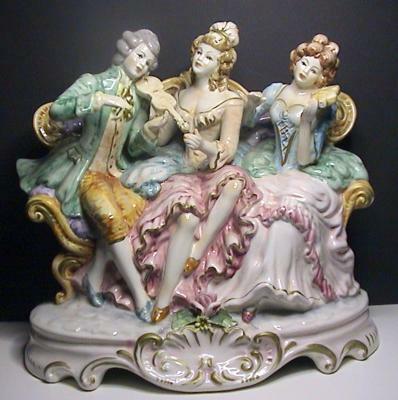 The Capodimonte figure depicts a gentleman and two ladies sitting on a sofa. The gentleman and one of the ladies are playing the violin. 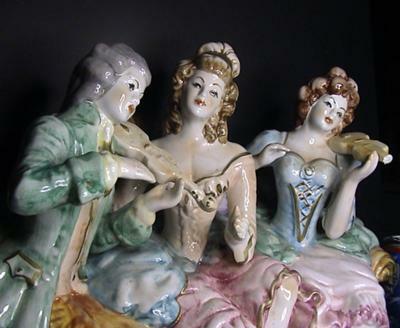 My problem is trying to determine the age of this Capodimonte porcelain figure. I have looked around at other antiques sites and what I have been seeing tells me that this could be from around the late 18th to early 19th century, which would make the figure around 150 to 200 years old. 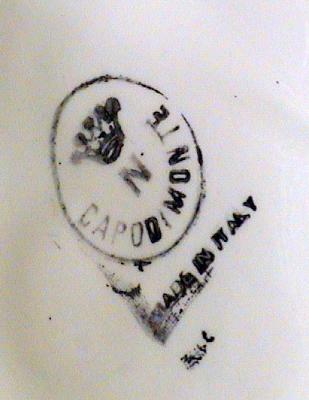 There is a crown above an N stamped on the inside of the figure and it says CAPODIMONTE in capital letters. The end of one of the violins is broken off. Other than that, this figure is in pretty good condition. I have scoured it for flea bites and other condition issues and have found none other than the broken violin. As I have stated before this is a very large piece Measuring 16 inch wide x 15 inch tall x 8 inch deep. I guess most people would be interested in where I got this huge Capodimonte porcelain figure and how much did I pay for it? Well I actually bought this stunning Capodimonte porcelain figure at a church re-sale for a whopping $2.00. 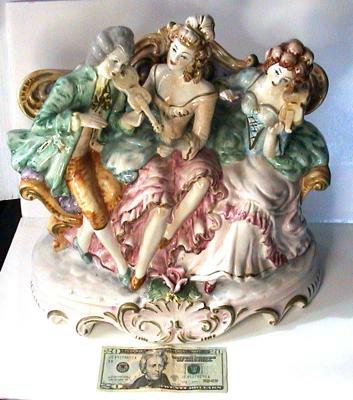 The first photo above shows the size of the Capodimonte Porcelain Figure compared to a dollar bill. The left of the three photos above shows a full frontal view of the figure with the next two photos showing a close up of the quality of the Capodimonte figures and the Capodimonte makers marks. If anyone can add any other information about it, I’d greatly appreciate the feedback.